Pour les locations de dernière minute ou les locations prolongées, veuillez vous renseigner sur nos tarifs réduits. La villa spacieuse a un total de 3400 pieds carrés, 3 suites principales, 7 chambres à coucher, 5 salles de bain et une piscine privée blindée surdimensionnée avec clôture pour plus d'intimité. Une suite de maître queen et 2 canapés-lits en bas des escaliers et 2 maîtres roi, 1 lit queen, 6 lits jumeaux à l'étage. Toutes les chambres ont des planchers de bois. Il y a une télévision 50 'Plasma. Il sera confortablement accueillir jusqu'à 18 personnes. Il sera entièrement climatisé et aura tout ce que vous devez fournir la liberté et de polyvalence que vous voulez sur vos vacances. Internet haut-débit est disponible dans la maison. Cuisine équipée, Lave-linge et sèche-linge dans la maison. Tous les draps et les serviettes sont fournis. Plancher en bois stratifié à travers toutes les chambres. La piscine privée de 30 ’x 15’ a été agrandie pour vous donner encore plus de plaisir. Il est entièrement blindé pour garder les insectes, mais permet au soleil dans. La superbe terrasse prolongée est l'un des plus importants offerts par une maison-constructeur dans la région. La cour arrière est entièrement clôturée. Il donne un sentiment de tranquillité et de paix. Populaire Hampton Lake: Bienvenue dans notre villa de luxe avec 7 chambres, 5 salles de bains, peut accueillir 18 personnes plus un bébé dans un berceau, 3400 pieds carrés, construit en 2004. Cette villa de luxe est situé dans le très populaire Estates Hampton Lake. Les collines et les orangeraies fournissent la toile de fond à cette parfaite maison de vacances de vacances. La villa est idéalement situé dans le privé Hampton Lakes Estate, qui est juste à côté de l'autoroute 27. A propos de 15 minutes en voiture de la villa vous amène à Walt Disney World et le plaisir peut commencer! Il se trouve à 40 minutes en voiture de l'aéroport international d'Orlando ou à 70 minutes en voiture de Sanford. Situé à 5 minutes en voiture de la villa donne sur la 192 qui a plus de terrains de golf que vous pouvez balancer un club à, avec une abondance de magasins, de divertissement et de restaurants. À proximité des parcs à thème: Notre villa est parfaitement situé pour tous les parcs à thème et d'autres attractions principales au sein de la Floride centrale. Islands of Adventure, International Drive et de nombreuses autres attractions trop nombreux pour être cités dans la zone Orlando Disney World, Universal Studios, Sea World, sont tous seulement une courte distance en voiture. Il y a aussi beaucoup de possibilités de shopping à portée de main avec un certain nombre de grands centres commerciaux et des magasins de design dans les environs. La côte du Golfe est à seulement une heure ou si loin à l'ouest, avec les parfaites plages de sable blanc de Clearwater et Saint-Pétersbourg. Ce côté de la Floride est également la maison de Busch Gardens, un parc mêlant les derniers tours avec une variété d'animaux sauvages. À l'est, le voyage est facile vers des destinations telles que Daytona Beach et le centre spatial Kennedy. Cette villa accepte les animaux domestiques (frais animaux applicables). We just left the house and we miss it already...what an awesome time we had. We were 14 and we were so comfortable. It’s a great place, very well maintained, well managed and we are grateful that we were able to have the days we had there....great memories...I highly recommend it to anyone traveling with a group. Property owner Ann was very helpful. Also I had a question and property manager Ken was quick to answer. Nice size kitchen & living/family room. Sofas were torn up so badly--needed sheets to cover them to sit on. Pool man on Friday right after check in told us furniture was ruined by last rental and new furniture was on order--just didn't arrive in time for our stay. They would be back the next day to fix the sliding glass door out to the patio and work on the TV's in the bedrooms that weren't working properly. There was NO one who even attempted to come and fix these things, not even a phone call. When looking into the "play room" there were more "ruined" pieces of furniture that looked like they had been there for ages. Clearly, wear and tear from years of use and not replaced. Unit was dirty--not good attention to cleaning. Rugs in front of shower simply turned over because they looked cleaner on the other side when it was really filthy. Mold in the showers, stains on the walls, floors dirty. Even the sheets had sand in them, not sure if they had really been changed. Trash cans were FULL when we went to empty the garbage! No Laundry soap provided nor indicated on paperwork. When it came to doing the towels, we didn't know laundry soap wasn't provided. Thanks for the review. To be honest, the feedback took us by surprise. We reviewed it together with the property management and confirmed that this group had never contacted any of us during their short two night stay. Property manager's response: "Our policy is guest should report problems within 24 hours of there arrival. If guests don't call us or contact booking agent during there stay we assume all is well with guests. Why did they contact us if they had issues so to give us a chance to rectify, if these were true??" Manager also confirmed that a brand new could has been purchased and delivered. From the time i walked through the front door, I was over pleased with this property. The house was very clean and neat. The bedrooms are very spacious with bathroom access from any bedroom in the home. The pool was clean and the gas grill was very beneficial. The kitchen was fully equipped with utensils and dishes for anything we chose to cook. All of the TVs worked properly. The game room was very spacious with a "3rd" pullout couch and tv. Between this comfortable home and the Florida sun, it was a mind battle for me not to extend my vacation an extra week☺. It is close to I-4, Disney World, Walmart, and restaurants. 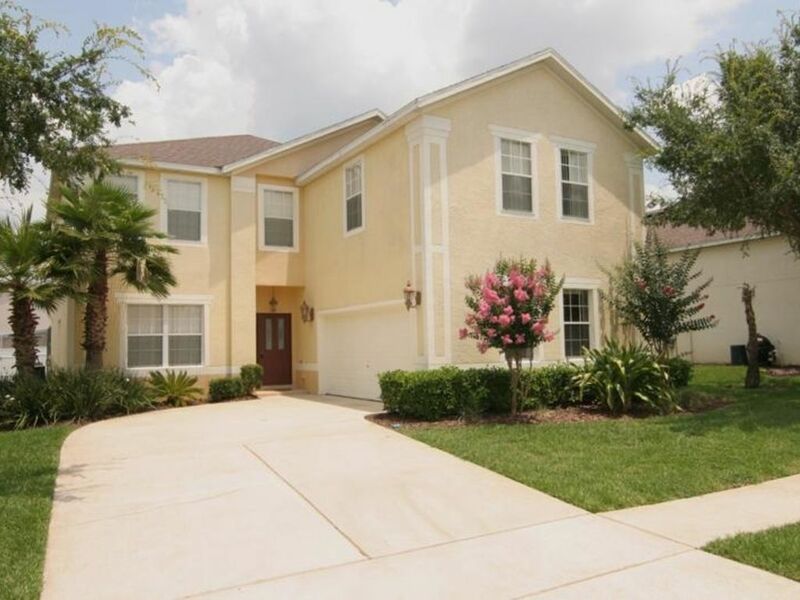 I would recommended this home to anyone I know travelling to the Disney/Kissimmee area. Thanks for the opportunity to reside in your lovely property Mrs. Ann Yu. I look forward to staying here again with my family. My stay at this property was great the house is well put together the pool is a nice accommodation the overall space of the property was a plus. I will be using it again in the nearby future .. The house was big enough to comfortably accommodate a group of 13. The owners were easy to communicate and work with. Thank you Jim. It was our pleasure to host you! For last minute rentals or longer extended rentals, please inquiry about our discounted rates. * A 13% tourist tax is applied. * Optional pool heat is $25/day (discount rate is available for rental a week or longer). * Pets fee applicable. * All rate is subject to change without notice.